Are you aware of the ingredients contained in the many multivitamins? Usually we believe what we hear and do not believe the mass marketing and media and what they have to say about some product. That is why we purchase multivitamins because we believe it has significant nutritional value. But, do these multivitamins provide a significant nutritional value? One of the top multivitamins in US, Flintstones vitamins contains a number of GMOs, aluminum, petroleum-derived artificial colors, aspartame and more. All of these ingredients are actually toxic. Aspartame is known to damage the brain at any dose by leaving traces of Methanol in the blood. It makes you wonder why Aspartame has been approved as “safe” and is found in thousands of food products; not to mention children’s vitamins. It’s also linked to Lymphoma and Leukemia. It’s basically a synthetic combination of the amino acids aspartic acid and I-phenylalanine. It’s known to convert into toxic methanol and formaldehyde in the body. Sorbitol is actually a synthetic sugar substitute classified as a sugar alcohol. Consumption of large amounts is linked to gastrointestinal disturbances from abdominal pain to some serious health conditions such as irritable bowel syndrome. Hydrogenated soybean oil is actually a semi-synthetic fatty acid that incorporates them into our tissues. They may cause some serious harmful health effects, from coronary artery disease to cancer and fatty liver disease. This is quite remarkable that Ferrous Fumarate is an ingredient here. There is a clear warning on the Flintstone’s web site concerning this chemical. It’s used as an iron supplement. When consuming iron that comes naturally in food, it’s impossible to inject toxic amounts that can cause death. But when taking Ferrous Fumarate, fatal levels of toxicity can be reached. Cupric Oxide is listed as a very hazardous substance, according to the European Union’s Dangerous Substance Directive. It is harmful and dangerous to the environment. It is mostly used as a pigment in ceramics and as a chemical in the production of rayon fabric and dry cell batteries. 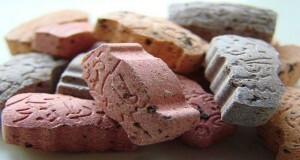 It is a mineral but surely not a nutrient for children’s. Most pharmaceutical companies, like Bayer, the developer of the Flintstones vitamins, do not have the best track record. Bayer is a German chemical and pharmaceutical company founded in 1863. In 1925, it became part of IG Farben, a German chemical industry conglomerate. This chemical company had board members that were responsible for the creation of the Federal Reserve, like Paul Warburg (pictured here), who sat on the board of the Federal Reserve as well as I.G Farben. It was a corporation well connected with the Rockefeller’s, and the second largest shareholder in Standard Oil. The investment was part of a pattern of reciprocal investments between the U.S. and Germany during the Nazi years (3). It’s well known that IG Farben was closely connected with the Nazi’s. They held the patent for the pesticide Zyklon B, the chemical used in gas chambers. Some of IG Farben’s directors were accused as war criminals, while others continued on with the agenda we see taking form today. We can see a conflict of interest through the companies shareholders when it comes to the creation of pharmaceutical products. We should examine what the feed our children and it does not require much time. We all live a robotic life style in this modern world and we don’t actually have time for taking care about our health. We’ve been programmed to grow up, work and spend most of our hours doing just that. While we participate in a 9-5, eat sleep watch TV; participate in a number of activities for entrainment purposes type of reality, there are those working behind the scenes manipulating the consciousness of the human race. We should change ourselves in order to become healthy and live our lives properly. The world is indeed waking up, something new is desired, the current Earth paradigm is one many people don’t resonate with any more. A lot of us feel that it’s time to move on, grow and explore our infinite potentiality. TLB Editors added embedded click-on-links and some pictorial content to this post.